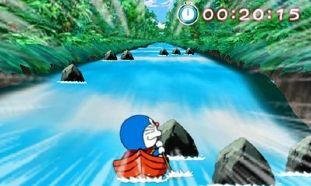 Doraemon, a time-travelling robotic cat from the popular Japanese manga series, is set to receive his very own Nintendo 3DS title. Doraemon: Nobita and the Island of Miracles – Animal Adventure is set to release on March 1st, and will be based upon the movie of the same name which is to hit cinemas across Japan on March 3rd. The game adaptation will follow the storyline of the movie, whilst challenging players within several mini-games that feature Doraemon and his friends. It’ll make use of the Nintendo 3DS’ gyroscopic capabilities for taking pictures of animals, which are then added to a guidebook that may be read at a later point to discover more information.